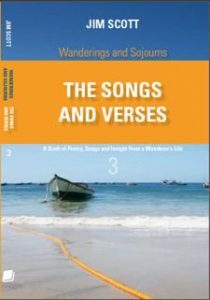 This, the third book in the “Wanderings and Sojourns” series, was created in response to requests from people reading sections of the first two volumes: “On Five Continents and Three Oceans” and “On Tropical Islands and Sparkling Seas”. Those requests/suggestions were for a book comprised solely of the author’s poetry and songs. Within these pages then are 80 such works including several found in the first two volumes but with many more favourites added. Here you will find the love songs that had no place in the previous books, some longer story-poems that themselves recount an entire tale, more parodies of popular songs, sketches of sea-folk, philosophies and insights born from the travels previously narrated. Here you will find a wanderer’s reflections upon a life of unique experience. The poetic styles crafted are as varied as the themes; from the blunt language of the “lower decks” sailor to an ethereal abstract allowing the reader to add whatever interpretation they will to the meaning; from the nonsense child-like rhymes that carry an adult message to the wistful lament of the broken heart. Each reader will relate many of the poems to their own experiences and perhaps, for just a while, share with the author the spirit of what is written as it disturbs something from deep within their memory, their personal philosophy, their soul.